On Sale Now! Save 7% on the Real Science-4-Kids Chemistry Pre-Level I Student Workbook (Real Science-4-Kids (Paperback)) by Brand: Gravitas Publications, Inc. at Cmc Schools. MPN: black & white illustrations. Hurry! Limited time offer. Offer valid only while supplies last. The Pre-Level I Chemistry Laboratory Workbook includes ten hands-on experiments that incorporate the chemistry concepts found in the student text. Brand: Brand: Gravitas Publications, Inc. 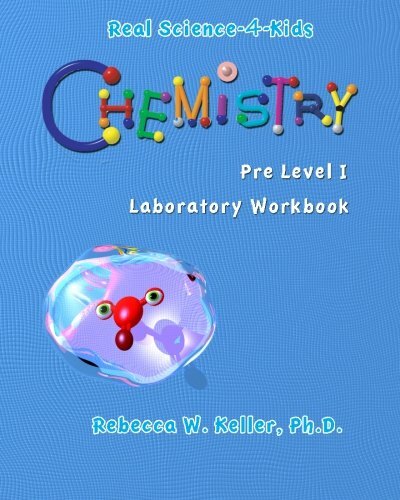 The Pre-Level I Chemistry Laboratory Workbook includes ten hands-on experiments that incorporate the chemistry concepts found in the student text. The experiments include an introduction to atoms and molecules, an introduction to acid/base chemistry, mixtures, polymer chemistry and an introduction to proteins and DNA. The experiments are teacher directed and require the Pre-Level I Chemistry Teacher's Manual. If you have any questions about this product by Brand: Gravitas Publications, Inc., contact us by completing and submitting the form below. If you are looking for a specif part number, please include it with your message.